It sounds crazy when it’s phrased that way. I know this might surprise you, but being a motorcycle blogger has nothing to do with sitting in a dimly lit room hunched over a laptop slowly developing carpal tunnel while eating Cheetos and drinking Diet Coke. I know… Shocking. It’s about capturing those wind in the face moments from the road. We’ve had a truly incredible run of good weather here in the Northwest. 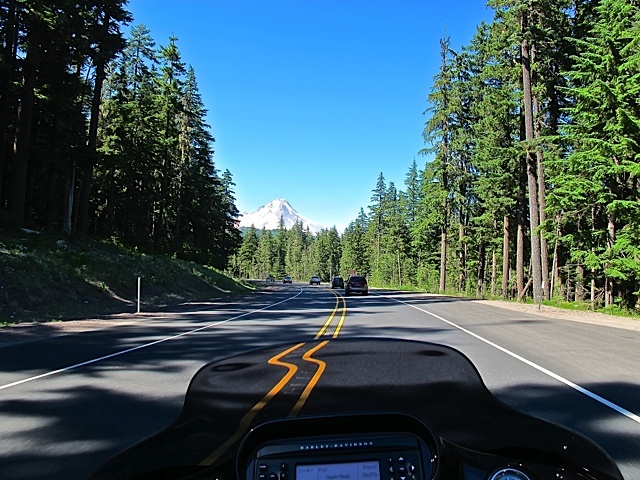 Summertime is in full swing and these warm, sunny days have the roads filled with bikers. It’s possibly record setting for the number of days without rain in July and last Saturday I had the chance to put on 200+ miles riding to Tygh Valley and around Mt. Hood. Some buddies were headed to Run 21 for a couple of days and I was doing a ride along for the day to get some “seat miles” before I set out on another longer trip to Utah/Nevada in a few days. Run 21 is put on by the SE Portland Chapter ABATE of Oregon. The event is an old-school biker rally and has been held annually for 14 consecutive years. There is a great outdoor concert venue nestled in Tygh Valley and according to the rally flyer there was a good line up of music this year. Our group headed out east on I-84 mid-morning and there was a strikingly white Mt. Hood in the distance against bright blue sunny skies. We stopped for lunch in Hood River, and as we departed you could take in the scent of peach and pear trees in the warm fresh air. 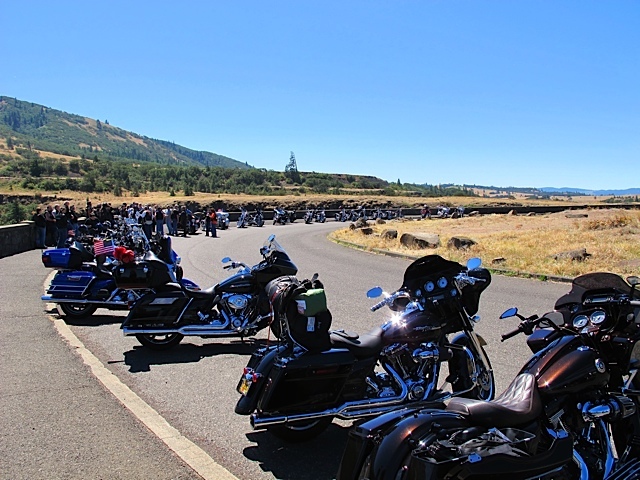 At Mosier we took the Highway 30 scenic road up to Mayer State Park and the Rowena Crest. 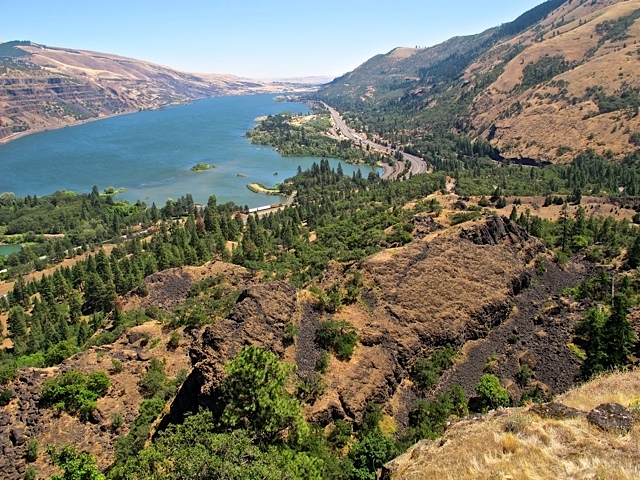 From this vantage you can soak in the wide-angle views of the Columbia River and the Gorge. There happen to be a “Bikers For Christ” meeting at the crest with 30+ riders in attendance. We headed south at the junction of I-84 and Highway 197. We stopped in the small farming town of Dufur for some refreshments and walked through the historic Balch Hotel lobby. Nice B&B if you’re ever in need of a laid back weekend. We continued on toward Tygh Valley where the rest of the group planned to exit for the camp ground. 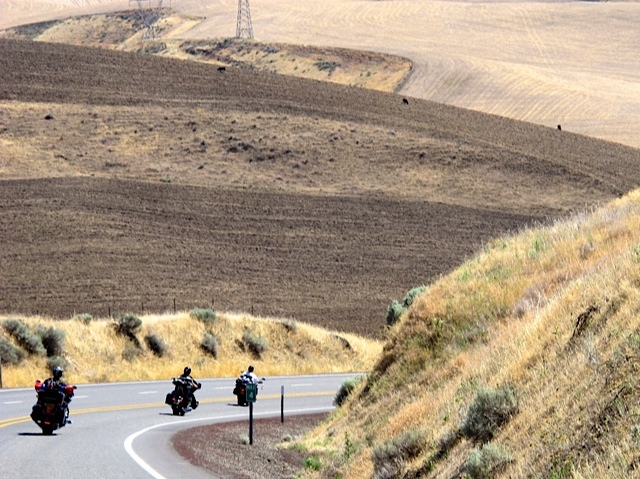 Unfortunately at the junction of Highway 197 (The Dalles-California Hwy) and Tygh Valley Road (map HERE) there were two motorcycles involved in an accident. It was about 3pm and according to the Wasco County Sheriff department the two riders were side-by-side and somehow got hooked up and went down. No automobile was involved and no citations were issued. One rider was taken by ambulance to Mid-Columbia in The Dalles and the other rider was taken by Life flight to Emmanuel Hospital in Portland. No names or additional information about the riders conditions were reported. Hopefully all goes well for these riders. I had to backtrack a little around the accident on old US Hwy 197 (Tygh Valley Rd) and then headed west on Highway 216 (Wapinitia Hwy). This is a nice two-lane road that skirts through a short section of the Warm Springs Indian Reservation and into the forest boundary. 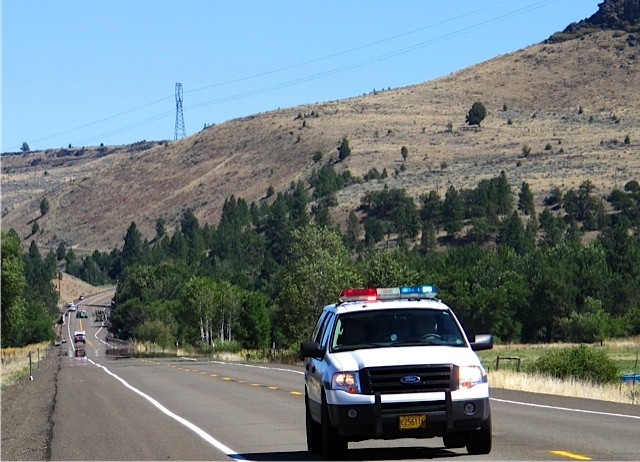 I intersected with Highway 26 and headed up over Government Camp and then back into Portland. It’s an awesome time to be outdoors on a motorcycle, and I hope you’re taking the opportunity to put some serious miles on your bike. It was so easy to wake up this morning in LaGrande. In the tent the night before inbetween the trains, the rain, the camp “traffic”, and general mummy bag discomfort I didn’t get a lot of sleep. A couple times in the morning I just sat there in the tent, staring at the wall, not wanting to jump into the day, but today it was different. Sure I obtained a very small taste of what those early pioneers had gone through to travel across this land, dealing with the weather and the harsh landscape, but today it was a shower followed with coffee in the motel lobby – sweet! It wasn’t as cold this morning, but the rain followed us. Over coffee we obtained guidance from the weather channel and called up some web sites on the iPhone. It was dismal everywhere with large sections of intense rain. We all agreed that riding most of day in rain was just not going to sit well so, we took our time departing with a Grand Slam breakfast at Denny’s. Then with a gorge head wind in our face we drove toward the sunset for the most direct route back to Portland. By the time we arrived in Boardman the rain had stopped and the sun was making it quite humid. We pulled off exit 164 at the C&D Drive In, on I-84 and gassed up. The posse wasn’t hungry and passed on the famous blackberry milkshakes, Walla Walla sweet onion rings and famous BOZO Burgers. It’s odd that the drive-in is linked to an espresso bar and pizza place, but little has changed since it opened in the 1950s. We stored our rain gear and rode on to Hood River where we stopped for a late lunch. Riding in the warm sunshine felt good after a couple days of riding in off/on rain. In Hood River it was downright warm with temp gauge registering 80 degrees. We decided to take in the Big Horse Brew Pub. We were a group of thirsty visitors and made the steep climb up the steps to this brewpub and restaurant. 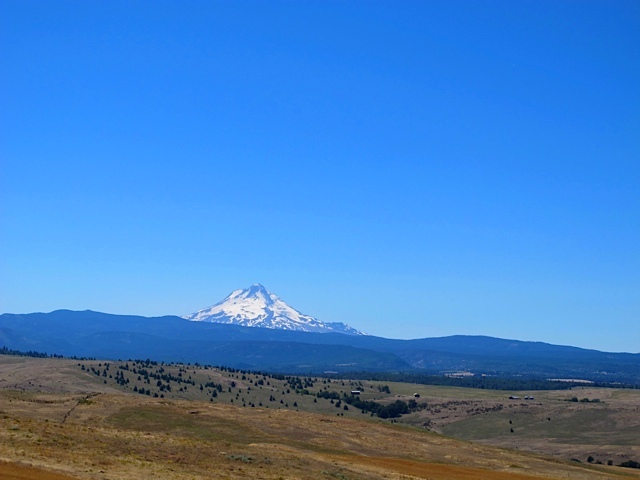 It overlooks most of Hood River and makes for a good non-participation windsurfing view point. Inside there are billiards and micro-brewed beverages of choice that are made in the building’s stone cellar. Lunch and service was excellent. Thanks Holly! We made our way down the stairs and headed to Portland. All in all, the rally was a lot of fun. The people/hosts in Baker City are terrific! The ride over and back as well as the rides and time in the canyons was incredible. I certainly plan to return. I’m on the fence about a re-do of camping and having now done it means I’ve worked it out of my system. I’ll likely make plans earlier in the year to score a motel and then do more rides out of Baker City toward John Day and into Idaho. Thus avoiding the larger crowds on the Hells Canyon byway and hopefully the rain too! If you’ve yet to experience the Hells Canyon Rally I suggest you add it to your list of to do’s. Hells Canyon Rally Wrap Up – Day 1 HERE and Day 2 HERE.